Normally children are discouraged from playing alongside the highway. But not in St. Louis, Missouri. This is all thanks to Bob Cassilly, a local artist best known for his renegade urban jungle-gym The City Museum, who sculpted these family-friendly stone creatures in the late ’90s. Rather than swings or slides, the park consists solely of concrete reptiles, far larger than their real life counterparts. Kids and (limber) adults alike can climb and frolic to their heart’s content in this odd sculpture garden beside a busy Midwestern thoroughfare. 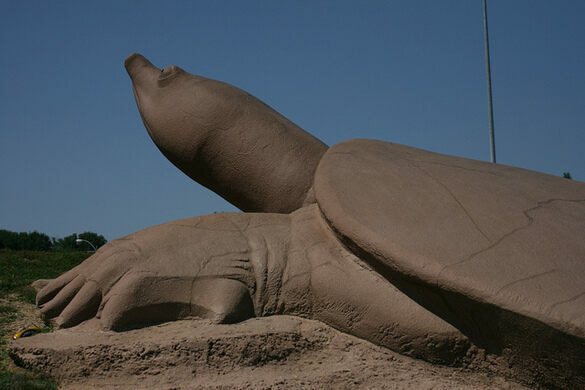 The sculptures themselves consist primarily of turtles, as the name would suggest, and one long snake, its body configured into an archway to provide the entrance to the park. The species represented are local to the area. Snapping turtles and box turtles are part of the park, and baby turtles hatching from their eggs provide themed seating. The park underwent a somewhat controversial transition in 2007, when construction on Highway 40 was taking place. The city had scheduled the overpass adjacent to the park for implosion. A few days before the demolition of the highway bridge, a thief stole into the park with concrete cutters and decapitated the great snake. After a few days of confusion and mystery surrounding the headless sculpture, the culprit was revealed. The “thief” was none other than Cassilly himself, apparently displeased with the notion that his creations, particularly his snake (at the time poised as if taking a bite out of the overpass scheduled for demolition), would be at risk of damage. The artist, convinced that only he had the right to destroy his sculptures, took matters into his own hands. Since then, the snake’s head has been re-attached and the park reopened to visitors. Parking is available on Oakland Avenue. You can also walk across I64/40 on Tamm Avenue if you are coming from Forest Park or the South Zoo entrance. University City's quirkiest resident lives in a park named after its first.